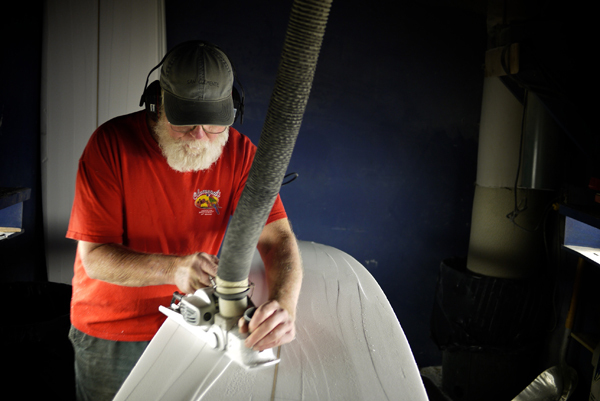 Terry Martin is a California surfer/shaper who has worked for Hobie Surfboards since 1963. He has shaped an estimated 70 thousand boards for everyone from 60s legend Corky Carroll to Tyler Warren. We recently caught up with Terry to learn more about his life of surfing and shaping. I grew up in San Diego, but I didn’t see the sport until I was 14. We lived inland. We went down to the beach … well, you know, my dad called them “breakers”. That’s all I knew. I didn’t know about riding waves. We just went to the beach and dodged the whitewater. We moved from Imperial Valley to Point Loma. When I was 14, I’d go to the beach. I saw four guys on paddleboards. I thought, “They ought to be further out. They’re awfully close to the breakers. They’re gonna get caught.” Then, the swell came in and they started paddling to the beach. Two of them caught the wave. They stood up … stood up! I was dumbfounded. I went, “This is the neatest, funnest thing I’ve ever seen. I gotta do this. This has really gotta be fun. I mean, you’re just using gravity here.” I was enamored and I ended up buying one. I was doing lawn jobs. At one place, the guy had a paddleboard. He said, “Yeah, it’s my son’s. He’s in the military. Are you thinking about getting one?” I said, “Well, ah, yeah.” He said if I did a couple weeks’ worth of yard work, he’d give it to me. “In fact, just take it now,” he said. Is that what started you on the idea of shaping your own board? Yeah, there were no shops then, so you either bought someone’s or you made your own. I wanted to design something that would work. I’d never made anything like that, but I had a strong desire. I made a board out of balsa and redwood. It was 10 feet. No fin. There weren’t just paddleboards in those days. There were also “planks” made of balsa, redwood—maybe spruce, mahagony. It was at the beginning stages of the lightweight board, so you could maneuver. I learned how to surf in one day. Until then, you stood up, you had a classic stance, you put your arms out to balance. You just looked like an old poster. Do you remember your first wave on that board? Oh, gosh yeah! I took off on that first wave. It had no fin, so the swell picks up the back of the board and spun it right around. I went, “Oh, man! Maybe this isn’t going to work.” On the second wave, I used Body English. But I went right off the back because the board was so much shorter and lighter than what I was used to. The third wave, I stood in the middle of the board. And, boy, I was off and running! I don’t even remember turning. I don’t think I’ve turned yet! That first day, I was so elated. After about a week, I was doing things even these good surfers couldn’t do because, instead of 80 pounds, it was 20 pounds. What was the reaction from the other surfers? They were like, “Hey! This kid’s getting pretty good, pretty quick. He just started and we’ve been doing this for years.” One of them (longtime San Diego surfer Sunny Maggiore) paddled over and made me get off. He said I was cheating. I’m going, “Wow.” I was demoralized, but I was so stoked by what I’d just made. Even though he said that, I thought, “I’m gonna go figure this out. I’m gonna ride it.” Day after day after day, my folks were so mad at me. Surfing was not the thing they wanted me to do. Anyway, Sunny was a small guy. He could ride anything. I couldn’t get my board back because he was having so much fun. When he came to give it back, he said, “I want one of these.” I could have made another one of those things blindfolded. In those days, we weren’t using power tools. We’d just use a big old jack plane—just mowing wood, using saw horses. It was an all day process … or maybe two. I didn’t know anything about fiberglass, so I put varnish on it—a bunch of coats—and waterproofed it. Waxed it and went surfing. Fabulous. I knew from talking to Bud Caldwell, the yard foreman at the Kettenburg Boat Works, to use four to six coats of varnish. You didn’t have the extra weight of fiberglass. Was this the beginning of your shaping career? It really started simultaneously with surfing. Sunny got his, then his friends started asking. At that time, guys were surfing at Sunset Cliffs. It was reefs and channels. You paddle out, catch a wave, paddle back through the channel. Never get wet. Sunny was doing all kinds of things (on the board Terry shaped). Next thing you know, somebody else came to me … and somebody else. And that was a long stint of making boards. At that age, did your shaping ever get in the way of school? I made a promise to myself in seventh grade: I would never ditch school and I would never get an F. I never did ditch school and I came awfully close. but I never failed. It could be 8 to 10 feet, oily glassy, and I’d go to school. I worked on weekends. I lost out on all the social stuff that you learn by going to school. People didn’t mean as much to me as surfing meant to me. I didn’t have a date till I was 18. What was the first surfboard company that hired you? Hobie Surfboards. I did this on my own for 11 years. At that time, I worked in a shipyard, I worked as a Fuller Brush salesman and as a carpentry apprentice. Worked on bridges and everything. None of it interested me. I was in Oregon for five months. All they talked about at lunchtime was CB radios and hunting bears. I really like anything to do with the water. I would have loved to have gotten a job maybe making surfboards. I got so frustrated with construction. I held off making surfboards full-time because I didn’t think you could make a living at it at that point. I got frustrated and I thought, “Okay, it can’t get any worse than this other stuff I’m doing.” I had a wife and a baby. I told Hobie, “If you give me the opportunity, I’ll do my best to be your best employee — because I really love this sport. I know my boards aren’t what yours are like, because I don’t know all the secrets, but I’ll try to make them work.” I worked hard—10 hours a day. I commuted an hour each way from San Diego to Dana Point. Then we moved to Dana Point. I worked there from 1963 until now. I shaped boards on my own here and there, but mainly with Hobie. All the Hobie boards were similar at that time. By then we were into foam and fiberglass. There were seven shapers at Hobie. I wanted to make a board as if he made it. I wanted to be consistent. I was one of his mainstays, so I could shape a whole slew of surfboards every day. I could do five, or I could do 10, because I wouldn’t get tired of it. Was it like today where surfers would come in and ask for a specific shape or dimensions? They did but on a real small scale. The thinking had to evolve. Corky Carroll could ride anything and he’d look good on it. He’d come in with a model of some new thing — Corky Carroll Super Mini or whatever. I’d shape it and he’d just dazzle everyone on the beach. Then, a kid would order one and it wouldn’t work at all. So that can ride against you. The rider dictates how the board should be shaped. Today, guys know exactly what they want and you better be on your game or you’re not going to be doing his next one. How did the Peter Pan Slug model come about? “SEND IT!” he said. Someone bought it right away. Then another. He called back and said, “Make it uglier. Give it a nose patch. Make it split-pea soup green. Ugly.” Good grief, we sold it just like that. Peter Pan called it The Slug. We sold so many of those things because it just worked good. It was a downrailer in the nose, downrailer in the tail. And a big tennis ball rail. Floated well and rode well. And Peter still orders those things. How many boards do you think you’ve shaped over the years? I don’t know. I did count one year. I got to 1,700 after nine months. Then the shop where we were burned down. That was the only year I counted. I think with the (recent) crunch, it’s slowed down. I’ve read estimates that you’ve shaped anywhere from 50,000 to 70,000 boards in your career. What are your favorite boards to shape? I like them all. I’ve done it so long I’ve made all of them—little boards, big boards, tandem boards. I’m still doing this because I like it and they keep asking me to make these darn things. I love the polyester foam. The only thing I haven’t made so much of is the stand-up boards. I don’t like epoxy. I’ve made a few, but avoid it if I can help it. It doesn’t like tools. I like sculpting; I like shaping and that stuff just does not like you to mess with it. I get a piece of fiddleback maple for making a didgeridoo. It’s an instrument developed by the Aboriginal people of Australia. I have jam sessions with my son-in-law. He’s a natural. I can go buy a didgeridoo for $300 or $500, but I’d rather make one. It’s the same with surfboards. I want to make it. It’s great when it’s going so good and to know I made it. It’s a God-given gift. 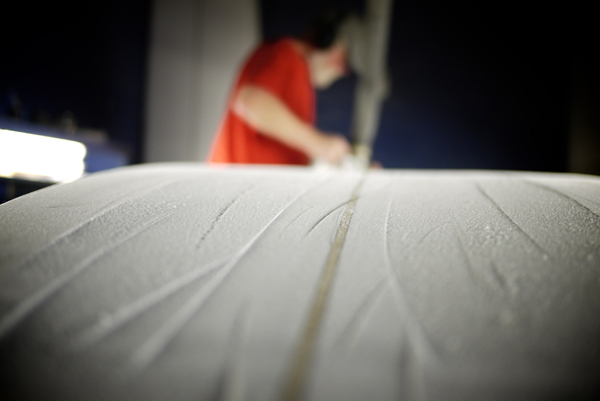 Find out more about Terry and Hobie Surfboards here. Photography by Glenn Sakamoto. Vintage photograph courtesy of Bill Stewart.